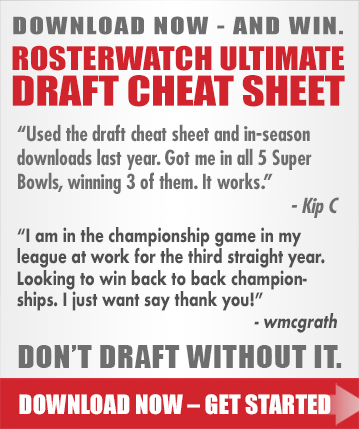 RosterWatch Nation, Version 1.3 of RW’s legendary cheat sheet for dynasty rookie drafts is live and available for download to PRO members. Use the cheat sheet the same way you use the redraft cheat sheet. Follow the three simple rules, and an expert-quality draft is guaranteed. PRO Members can access the cheat sheet on their downloads page or by clicking here. We’ve made a few changes to coincide with news coming out of the initial round of rookie minicamps. Thanks for the updates RW ! Help me understand your starting lineup. You say you can start up to six in each position? How does that work? Can I start 6 Qbs and call it a lineup? OMG your TE are sick., you might have to trade one of those young bucks in the next few yr. As you say, RB is your position of need. If that is Mike Evans you own, then I’d trade AJ Green. I might shop AJ anyways in dynasty. Kareem + Duke + TyM will prob hold you steady in PPR this yr at RB if that’s all you end up with. If we could sell high on Kareem and AJ Green we’d consider it , in order to improve rest of roster. Real solid squad. I like that you have 1+ star at each position. I’m definitely on board with moving a TE for a solid WR/RB – or – maybe a package of Tyrod/Njoku stack to the Baker owner for a superstar at any position? 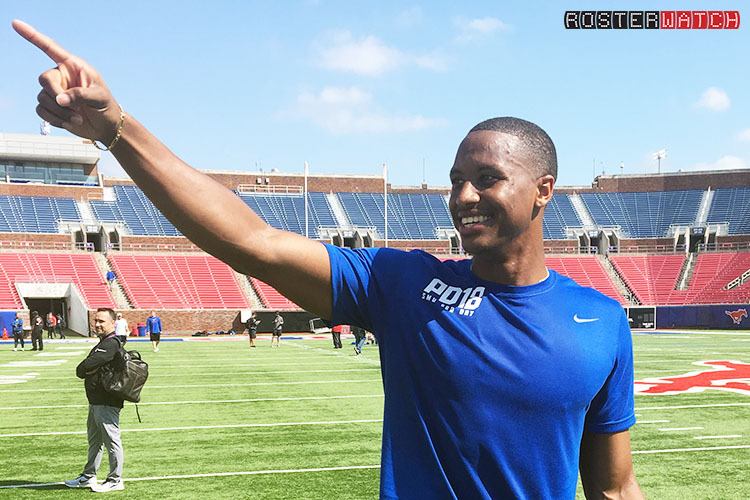 – or – AJ & a TE for a superstar? By superstar Im thinking the combo of youth & talent (Gurley/Zeke/Quon/DJ/Odell/Nuk/Wentz/Watson/Russ..) Te premium would let you fetch that maybe? Let us here how it plays out! I’ve been wanting to get in a dynasty league or maybe create one. Any tips on getting one going? A RosterWatch Nation dynasty league would be great cause it would just be even more maniacal. Happy Subscription Pull Day for myself! YES- you guys take care of this in-house and friendly neighbors of RWNation! Was hoping you guys would do a start up dynasty rankings. My draft is later this month. I used your rookie rankings as a guide in current dynasty league but have a new one starting up. Rankings is something we are re-valuating as part of our development list this offseason. Cannot promise an immediate change, but some improvements / increased breadth should be on horizon. Stay Tuned. Thank you very much for your loyal support! RW Nation – Through series of trades & my own version of The Process, I have picks 1.01, 1.02, 1.03, 1.07, 2.01 & 2.03 this year in my rookie draft June 8th. I have equal need at RB/WR right now. Taking my man, The Ambassador of Quon & Guice 1 & 2 as it stands now. Given that there are like 6+ players with valid arguments for the 1.03 slot & baking in current ADP’s, who do you all like at 1.03? Ive played out seemingly every sequence of events in my head & I’m going crazy! Draft twitter aint helping – need the advise of my most trusted advisors. The 6 guys I really want to come away with are Saquon/Guice/Royce at rb & Moore/Miller/Kirk at wr. RW NATION mobilize!! – HOW DO I MAKE THIS HAPPEN!?! MFL Adp says Miller and Kirk will be there for me at picks 13 & 15 but man I dont want to miss out on either of these two golden sons. SIde note – Been trying to trade back for weeks. No takers yet. Guys at 4,5,6,8 know that they will be getting solid options to pick from. Hi Shady- this is a great question. Going live for a SXM show here shortly. Will try to circle back on this in the morning! The sheet says take Ronald Jones at 3. That would be a boon of dynasty franchise changing RBs right off the top. Could be overkill, and we love the Rolls Royce at better value like you say- but it. doesn’t sound like a trade back is going to be easy to pull off. We’d forget about DJ Moore and focus on Miller + Kirk. You will be cutting it very close in RD2 for those guys. Best strategy would be to turn 1.03 + 2.01 + 2.03 into 1.09,1.10,1.11. if possible. Good luck, let us know how it turns out. Thank you very much for your support! Thank you sir, I was afraid you’d say to come off Moore!! I’m having a hard time quitting this guy.. but I have to wonder aloud if going quon-guice-royce 1,2,3 then “reaching” to secure Miller at 7 would be so bad. Then Kirk & maybe Gallop early 2nd. The best part is that if any of my guys get snaked ahead of me it will push any number of future studs right in my lap. Been planning this top 15 take over of 2017 for a few years now & now that it’s here IM SHITTING BRICKS to not mess it up!! Do we care that public opinion says Royce at 3 & Miller at 7 are “reaches” ?? Im making peace with it more everyday. I just really want these 2 guys on the team. If I go RoJo 3 then Ill have to choose Royce/Miller at 7..the risk of missing Miller at 2.1 is terrifying. Thanks brother. I’ll catch you guys OD as always on my morning commute. Cheers! MAN that’s gonna be a fun draft for you ! Guys get horny when they see their boy fell to where you are picking and may be more eager to move up! But worst case scenario maybe wait on miller for pick 201 ? Thanks for pitching in BVIC. Hope all is well! I cant wait!! You are totally right man, there are a few guys who I KNOW will be itching big time to get some action on draft night. I don’t want to come across desperate yet, so Ive been trying to keep my offers to the guys already in the 1st round near me. With all the Penny love all over the universe I have to believe that someone will be horney (well said haha) to move up come draft night. Agreed, Miller should be there 2.01, just cant settle on how bad I want to risk it vs just “reaching” for him at 1.07. I swear 1.08-1.12 have never been more valuable it seems. Got Jones 1.03 to pair with last years trade up to Fornette. Now waiting for A.Miller to drop to 2.03 alomost there. Going to turn this orphan franchise around this yr or next. Thanks RW! Would be a massive coup! 1 spot ahead got em. Michael Gallup is what the sheet said so I got him. With T.Will DUI and Hurns to the boys and all 3 on my roster, Gallup might be the winner early and TWill might get cut. Now I’m a huge Rain Dakota fan! Cant wait to see some of these updates! Have an update on an opportunity to slide back from 1.3. Already own 1.01, 1.02, 1.07, 2.01. Im fine with the RB Ill get at 1.06 compared to 1.03, So basically Im paying Mike Williams or Duke to slide up from 2.3 to 1.10 to solidify MIller time. Man Id hate to get off this Mike Williams train a year too soon though. Not to mention Duke’s 188 catches in first 3 years… Feels like Im over paying a bit? ?